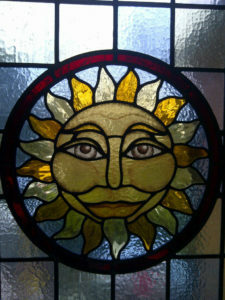 From us all here at Coriander Stained Glass we hope you have a lovely bank holiday Monday in the sunshine. We are keeping our fingers crossed that the weather stays good! 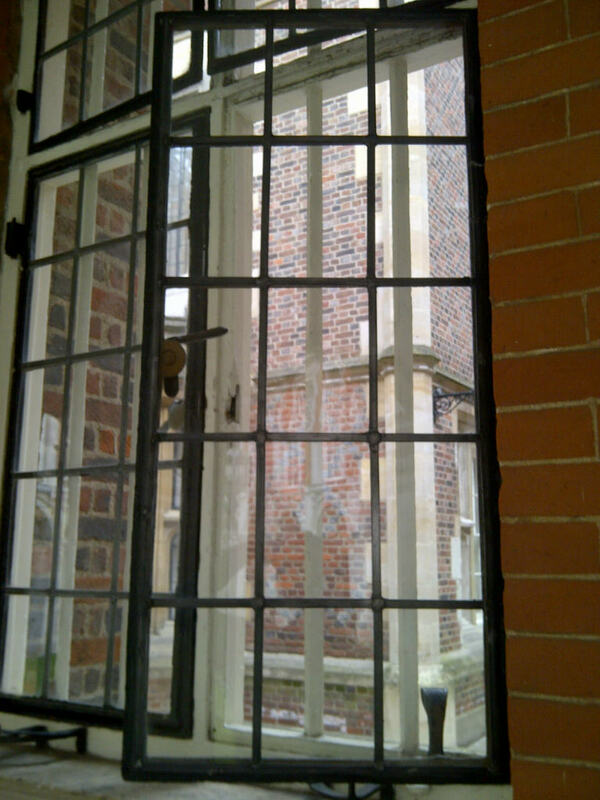 Today we’ve another project from Hampton Court Palace to share with you. 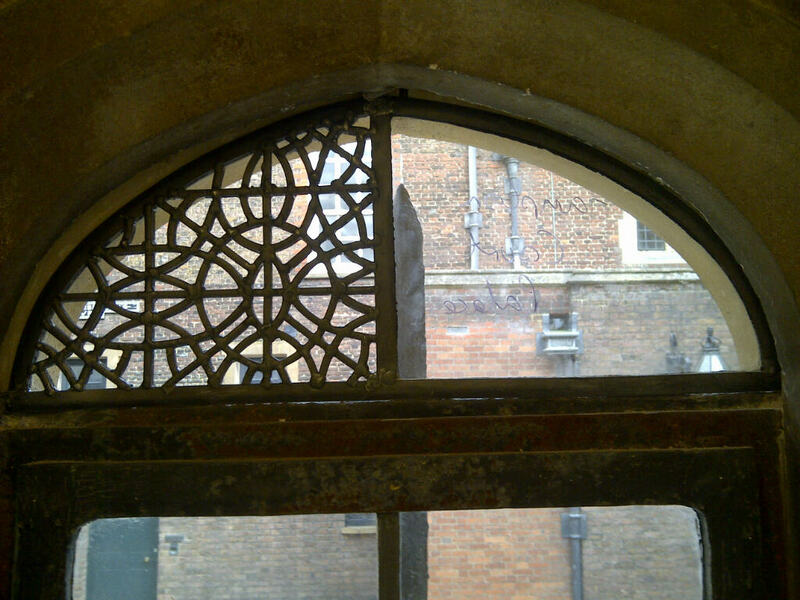 In the top left hand corner you will see our new vent created using a design of soldered lead, we believe that this method of vent construction is unique and approval was needed for its use by English Heritage. The manor of Hampton was first acquired by the Knights Hospitaller in 1236, when they used the site as a centre for food storage and accounts keeping. Excavations suggest that the Knights had a barn used as an estate office. The first tenant on the site was Giles Daubeney who took out a lease on the property in 1494. The palace as we know it today was originally built for Cardinal Wolsey in the early 1500′s, and for many years after that it was home to many members of the Royal Family. However, it has not been inhabited by the Royal Family since the 18th Century and has undergone extensive renovation undertaken by its’ many owners. We love the palace for it’s beautiful collection of art, the architecture, and of course, the maze garden! If you’re feeling inspired about a leaded light for your own home, take a look at our stained glass portfolio. Well that’s it from us for today. We hope you have a wonderful bank holiday Monday with family and friends and remember, we’d love to see what you’ve been up to, you can share your pictures with us via Facebook or Twitter. From all of us here at Coriander Stained Glass we hope you’ve had a lovely, relaxing weekend, with at least a little bit of sunshine! 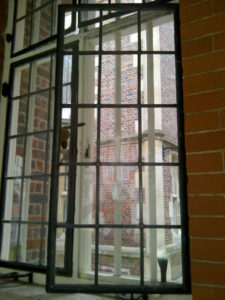 We’ve a few projects to share with you today of some more work we’ve completed for Hampton Court Palace. We have restored this traditional lead light in the Georgian House, which is one of the properties the palace lets out to visitors via the Landmark Trust. 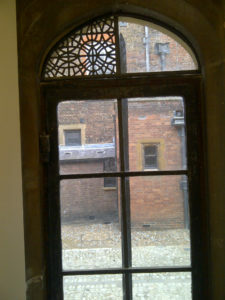 This is the second restoration we have carried out in the Georgian House. Built in 1719 The Georgian House was originally the kitchens for George, Prince of Wales. Now a stunning house with views of the Palace and its’ own walled garden, this alternative retreat sleeps 8 and pets are welcome. Founded in 1965 the Landmark Trust charity was established “to rescue historic and architecturally interesting buildings and their surroundings from neglect and, when restored, to give them new life by letting them as places to experience for holidays”. To find out more about the Landmark Trust charity take a look at their website. 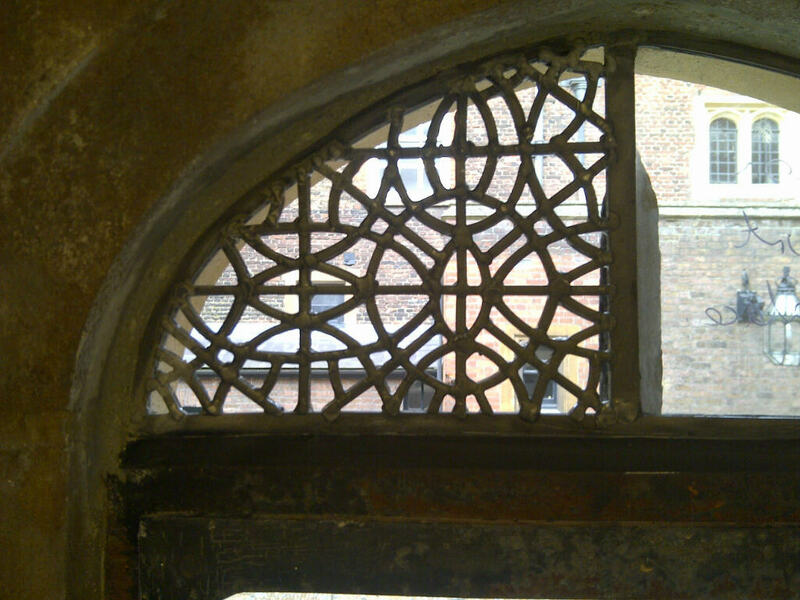 Our work for Hampton Court Palace is on going, and you can find more examples of projects we’ve carried out for them on our page dedicated to restoration work at Hampton Court Palace. 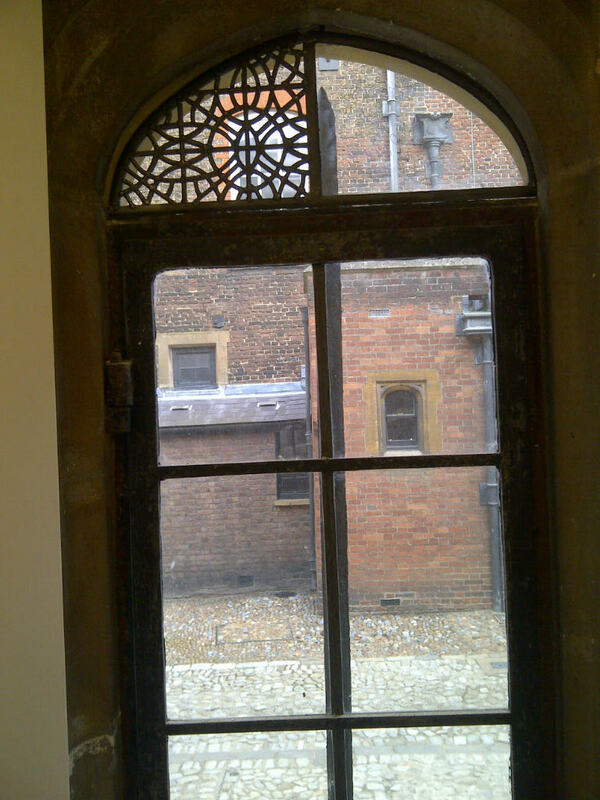 This second shot shows a rebuilt lead light in Fountain Court, Hampton Court Palace. Fountain Court was designed by Sir Christopher Wren and now the interior contains stately rooms and galleries, including the Cartoon Gallery on the south side of the court. Helping to maintain our British heritage is something we are incredibly proud of and we will continue to share with you any further work we carry out for Hampton Court Palace. That’s it from us today but check back later in the week for more of our latest projects. If you’re looking for some inspiration and ideas for a piece of stained glass for your own home, be sure to check out our stained glass portfolio. You can also follow us on Facebook and Twitter. 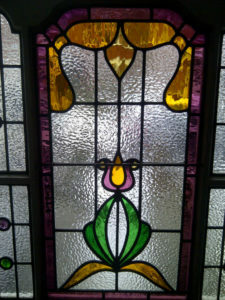 Good evening from us all here at Coriander Stained Glass. What better way to kick back and relax for the weekend with a bit of light reading! Today we’d like to share with you some of our latest projects, focusing on ways of incorporating florals into your stained glass. 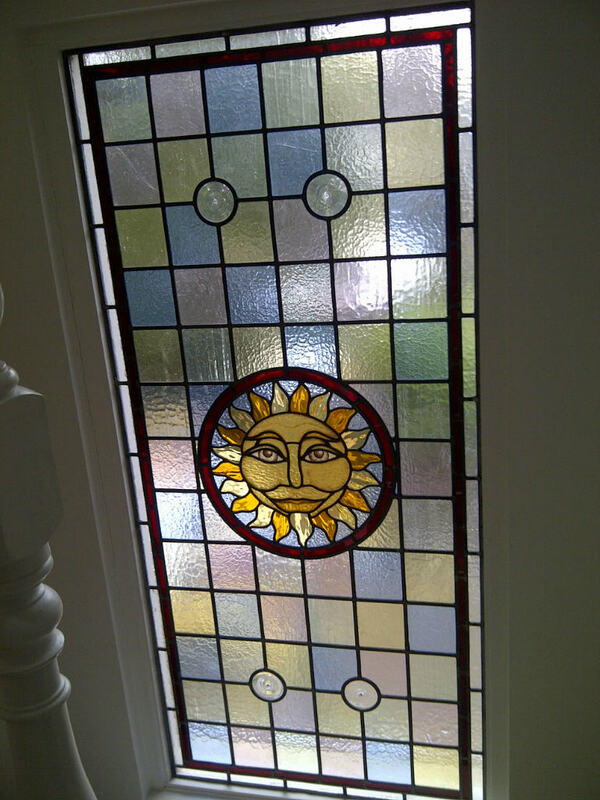 This first project is of an internal piece of stained glass fitted in a home in Wimbledon village. 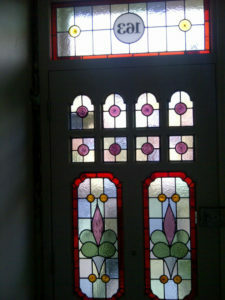 The art nouveau style of stained glass can be very soft and works particularly well for this internal door, with the focus being the flowing, floral shapes of leaves and the main flower. 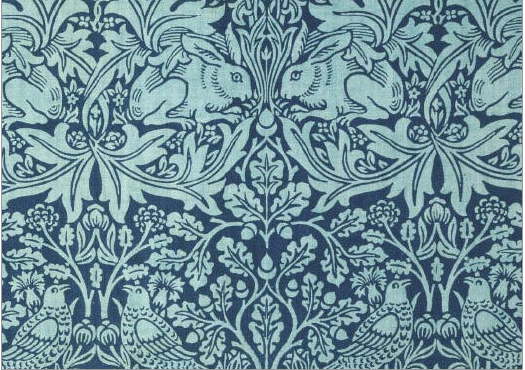 Artists such as William Morris were a great influence on the Art Nouveau movement. Undulating, flowing lines, with a “whiplash” like movement are defining features of the stained glass of this era, and for this reason are particularly well suited to the natural lines of florals. 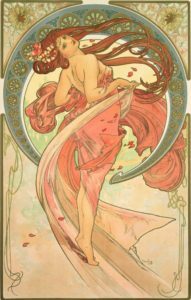 Another great influence on this era was the Czech artist Mucha, who’s pictures of women often reflected the sinewy shapes found in stained glass. Each of these have elements that would translate beautifully into a piece of stained glass and have a heavy focus on florals. These next few projects are Edwardian. 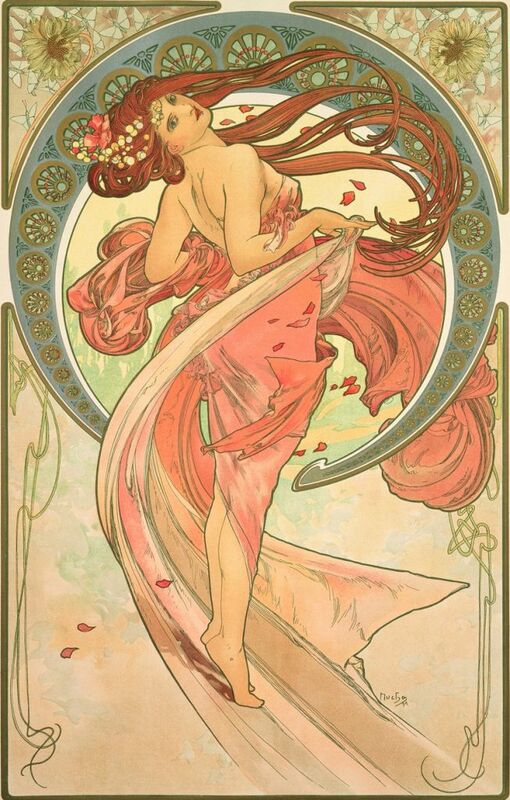 Heavily influenced by the Art Nouveau era, Edwardian stained glass typically reflects nature, and features long flowing, turning over leaves as well as short, curvy leaves, with tulips or roses as flower examples. 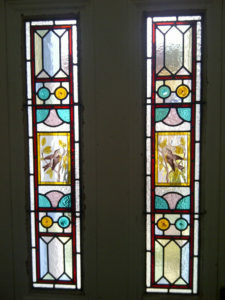 The piece on the right was a restoration job, and is a common design of this period, with personal touches being made in the choice of glass colour and texture. Edwardian Stained Glass works well as residential pieces in much the same way Art Nouveau pieces do. It is quite soft in appearance, but because of the typically clear, textured background glass it can often have quite bold, striking floral focal points. 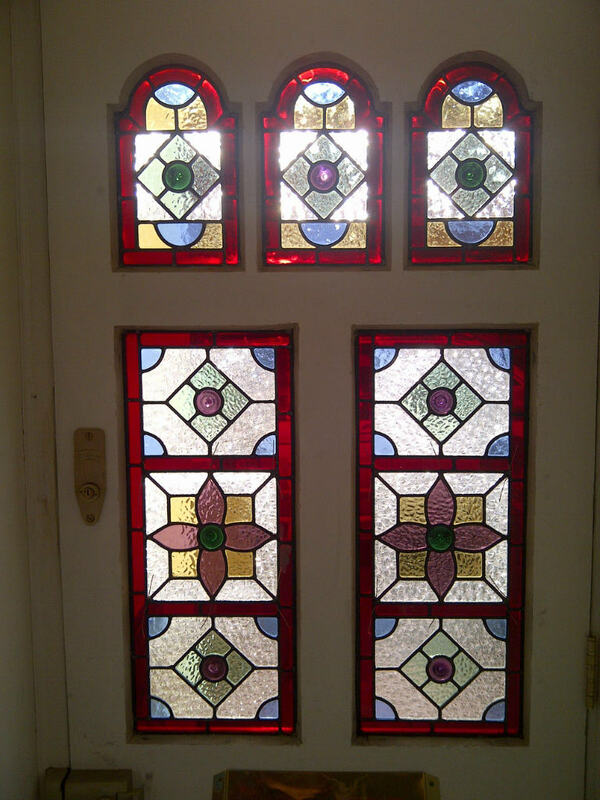 Well that’s it for today, we hope we have given you a few ideas for your own project, be sure to check our stained glass portfolio for more ideas and inspiration. You can also keep up to date with us on Facebook and Twitter. 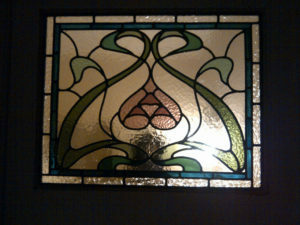 Good evening from us here at Coriander Stained Glass. We’ve a few projects keeping us busy and we’d like to share some of them with you today. Often when people are choosing a stained glass window for their home they choose one that is either in keeping with the age of the house, or sympathetic to the style of other windows in the street in which they live. 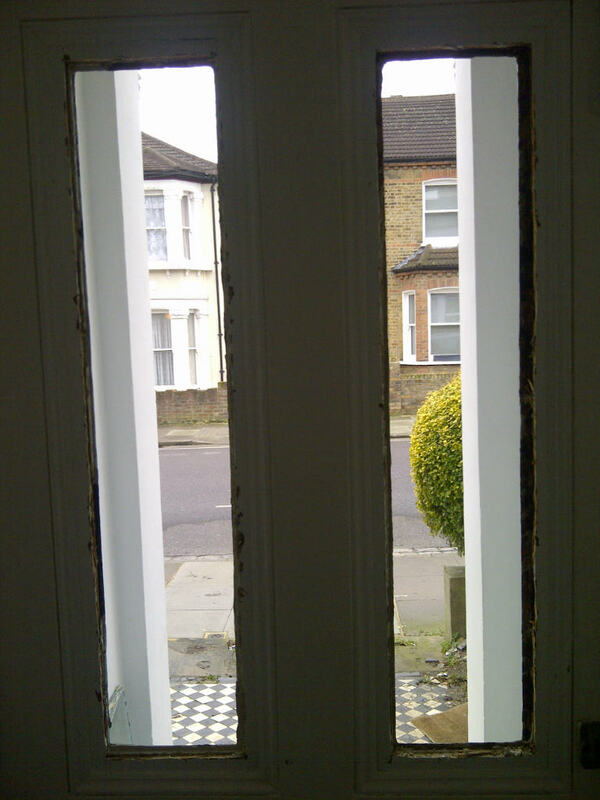 The following three windows were all completed in Clapham. 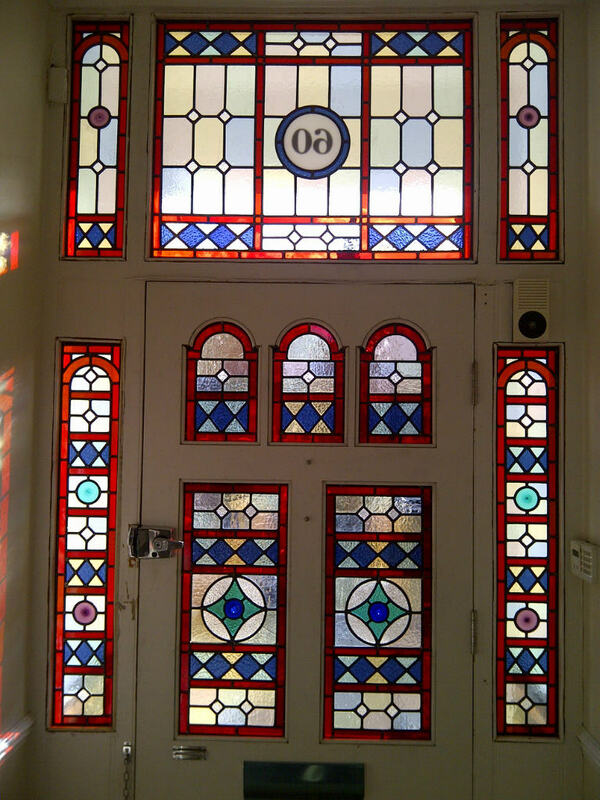 They all incorporate the same Victorian geometric design, all in slightly different colour schemes. 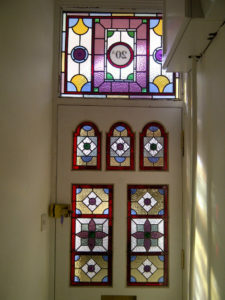 For the first job, you can see the before and after with the completed stained glass window, and what a huge transformation it has made to this entrance way. The subtle differences in colour scheme are personal touches added by each home owner, but the defining features of these Victorian pieces are the ruby red borders, geometric shapes and pastel shades. 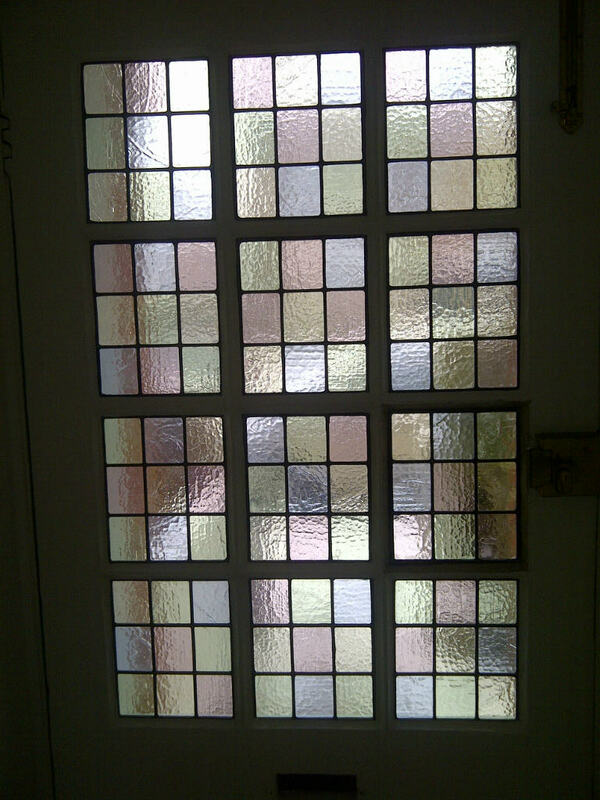 This next project shows a 1930’s style stained glass fitted in Southfields, London. 1930’s stained glass took some of it’s basic design elements and shapes from Edwardian Stained Glass and you can see that here in the above project. With textured, clear glass for the background and a pale border, the central features of this piece are natural, flowing, soft shapes. 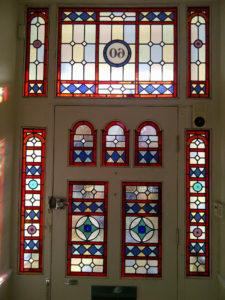 Also typical of this era is the picture window, which can be very ornate and include painted details. Our in house artist, Margaret, can re create your favourite painting or picture and incorporate it into a piece of stained glass for your home. 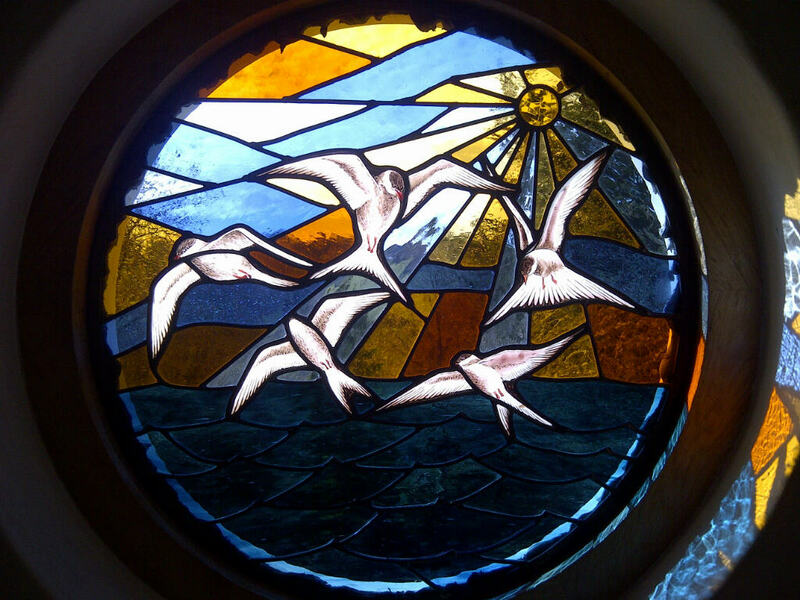 For examples, take a look at the painted glass designs portfolio page. That’s it from us today but we’ll be back later in the week with more projects. 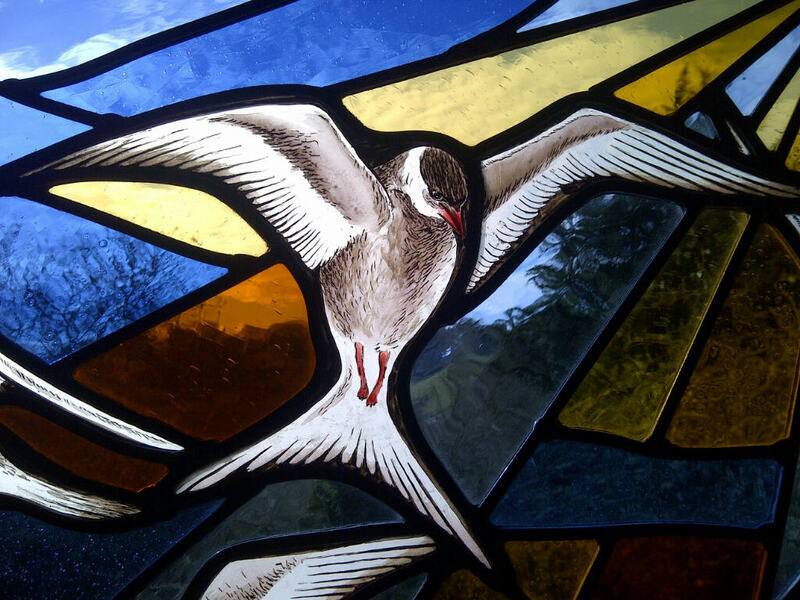 Take a look at our stained glass portfolio page if you’re looking for some inspiration, or you can follow us on Facebook or Twitter to keep up to date with our latest news. 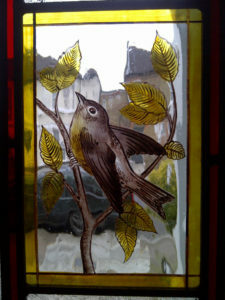 We’ve a few more projects to share with you today at Coriander Stained Glass. 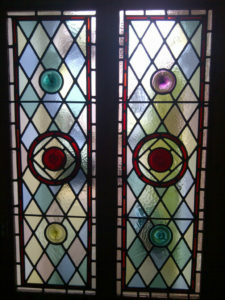 Despite the dip in the weather, we’ve been keeping busy with some lovely stained glass windows. A large part of our work is in restoring and renovating old or damaged pieces to their former glory. Be it an ecclesiastical piece within a church or a small residential piece in someone’s home, we take great pride in the quality of our restorations. This first example is of an Edwardian piece rebuilt for a home in Wembley park. 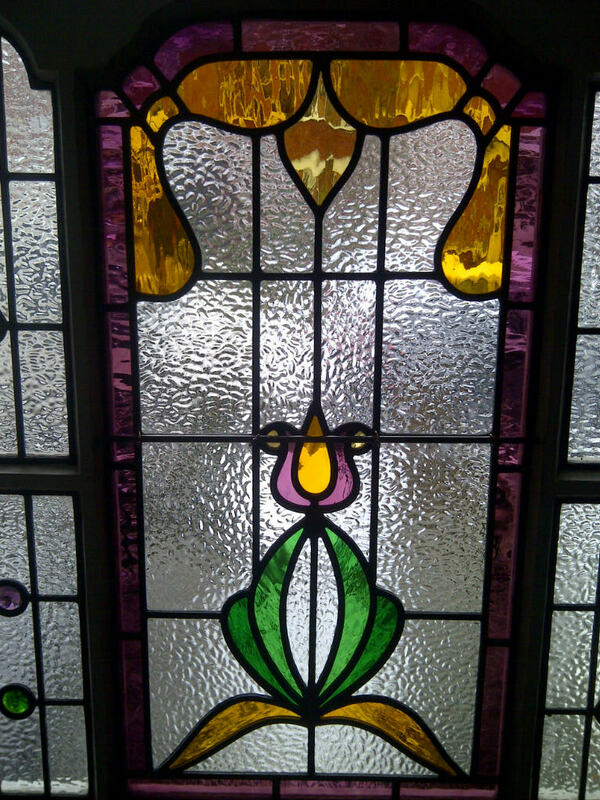 Typical of it’s period, this leaded light features a clear, textured background glass contrasted with the bright purple border and yellow insert, topped off with a bold floral central feature. 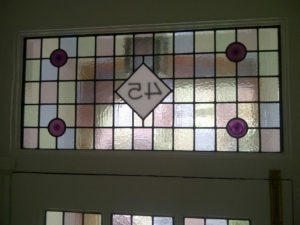 This next example shows a restored Victorian geometric piece, returned to its’ former glory in its’ home in Kingston. The ruby red border and geometric background in pastel hues are typical features of the Victorian period, with the central roundels in ruby red and the secondary, smaller roundels in pastel shades to compliment the background. 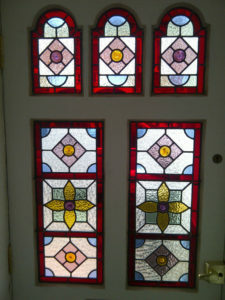 When a new stained glass window is created for a home there are several things to take into consideration. 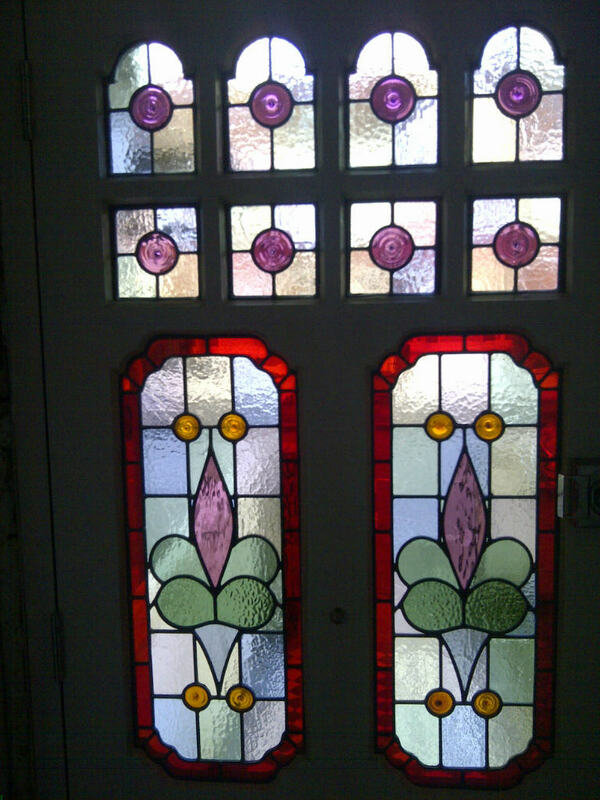 It could be that you are looking to remain sympathetic to the style and era of other homes in your street, or are looking to remake an original piece of stained glass that may have once been in your home in years gone by. In some cases, the most simple designs can be the most striking if you are looking to brighten up your entrance way. 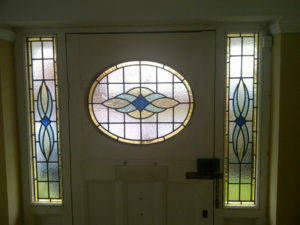 This is a Victorian geometric piece fitted in Putney. It’s simple geometric background in pastel shades and complimenting lilac roundels create a light and airy entrance way for this home. For more ideas an inspiration for a stained glass window for your own home, take a look at our stained glass portfolio. You can also keep up to date with our latest news on Facebook and Twitter. It’s the bank holiday weekend and from all of us here at Coriander Stained Glass we hope you are all having a wonderful time with family and friends. The sun was a bit slow to come out yesterday but it turned out to be a beautiful day, so fingers crossed for the rest of the long weekend! 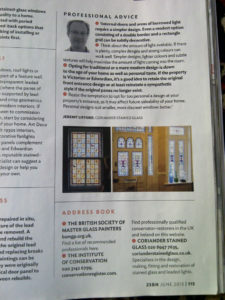 Some exciting news to share with you today – Coriander Stained Glass have been featured in this months 25 Beautiful Homes magazine. Each month readers are introduced to stunning real homes to provide ideas and inspiration. The windows featured in the magazine excerpt are from a home in St Margaret’s, Twickenham. The picture on the left is of the stairway window, the stained glass really catches the light beautifully on the hand painted flowers and bees, it is really a sweet little piece. The photo on the right hand side of the magazine excerpt is of the Edwardian front entrance, 11 panes of glass in total complete this piece and the pastel shades really compliment the flowing central floral focal points. 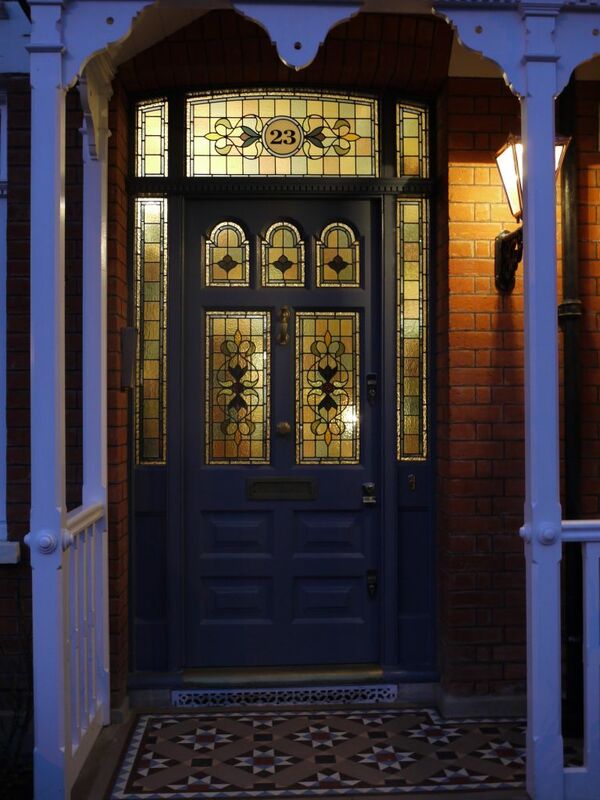 This shot of the entrance from outside shows off how wonderful the glass looks even at night. 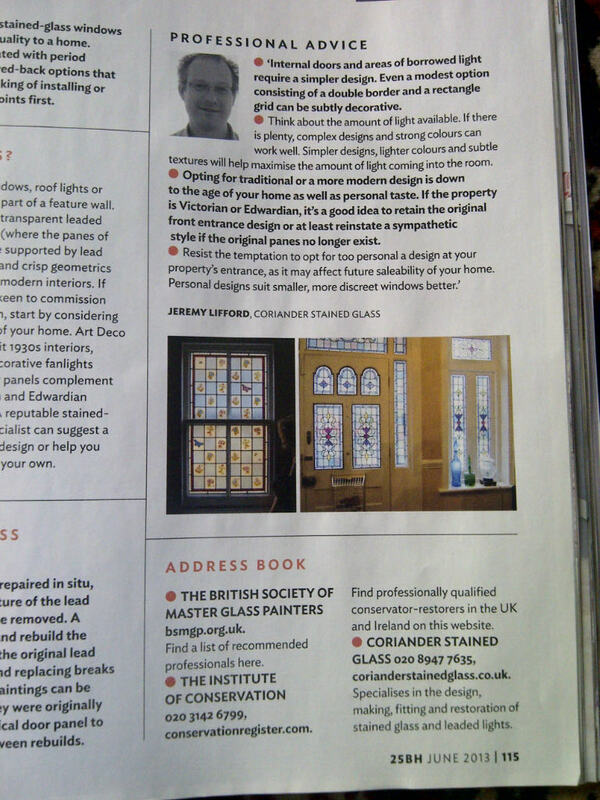 We are thrilled to have been included in the magazine, if you are thinking about a stained glass window for your own home, the full article is full of tips and really great ideas. 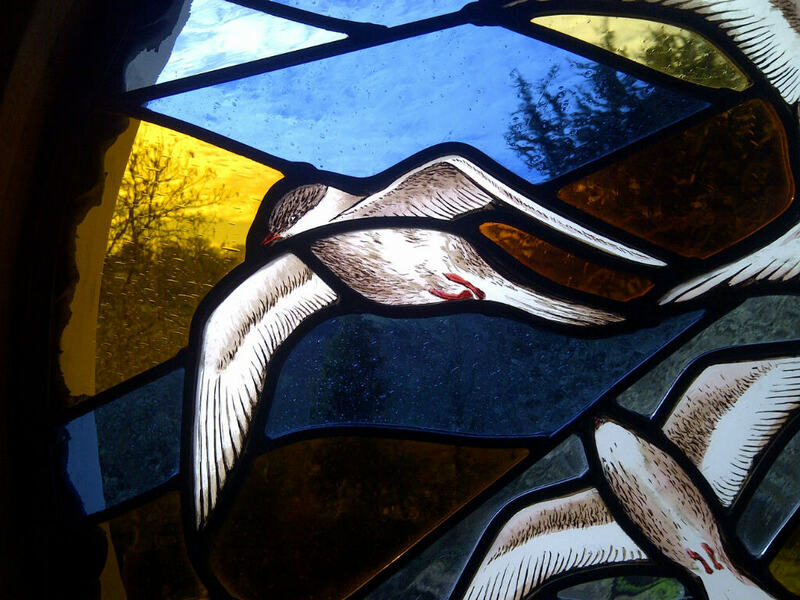 You can also take a look at our stained glass portfolio which is bursting with great examples from the Victorian and Edwardian era, Art Deco and 1930’s era – or alternatively why not go for something completely different? We can turn your photos, favourite pictures or sketches into a piece of stained glass for your home. That’s it from us for today but we hope you are all enjoying the bank holiday weekend, check back in a few days for more of our latest projects. You can also keep up to date with us on Facebook and Twitter, where we’ve been sharing some beautiful snaps from a recent trip to Belgium. Well the Bank Holiday weekend is fast approaching and it looks like the weather has picked up just in time! 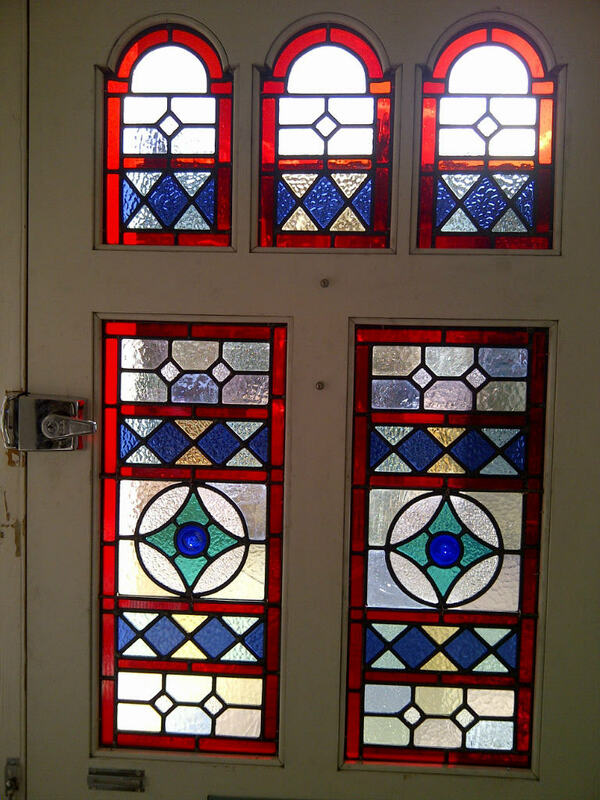 Whilst you kick back and enjoy the sunshine we’ve got a few more projects to share with you here at Coriander Stained Glass. Today we’re going to share with you two projects, explaining the key differences between the Edwardian and Victorian eras. At first glance, one might mistake these two stained glass windows as being from the same era – with the same striking ruby red border and use of pastel shades in the background, it is an easy assumption to make. 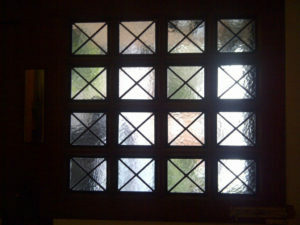 What defines these two windows from one and other is what is between the borders. 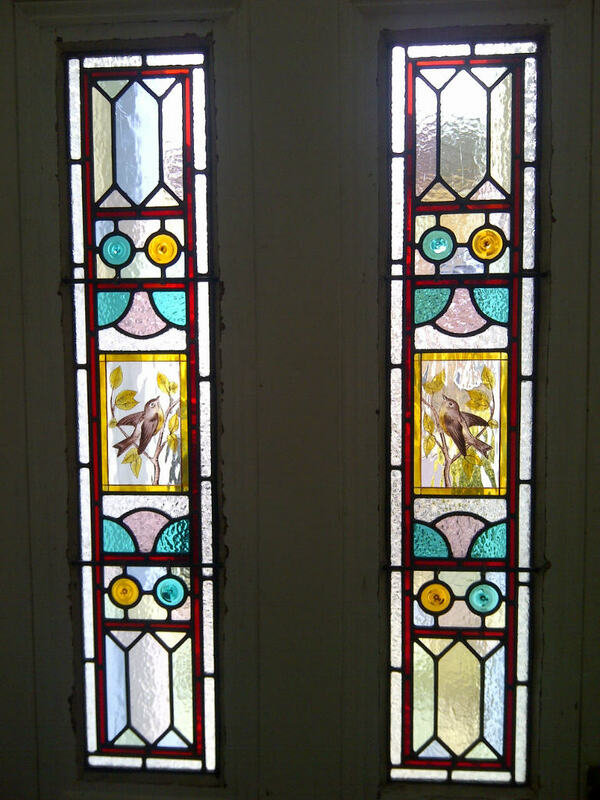 The Victorian window is easily identifiable by its use of bold geometric shapes, whereas the Edwardian piece has the flowing floral design typical of its era. 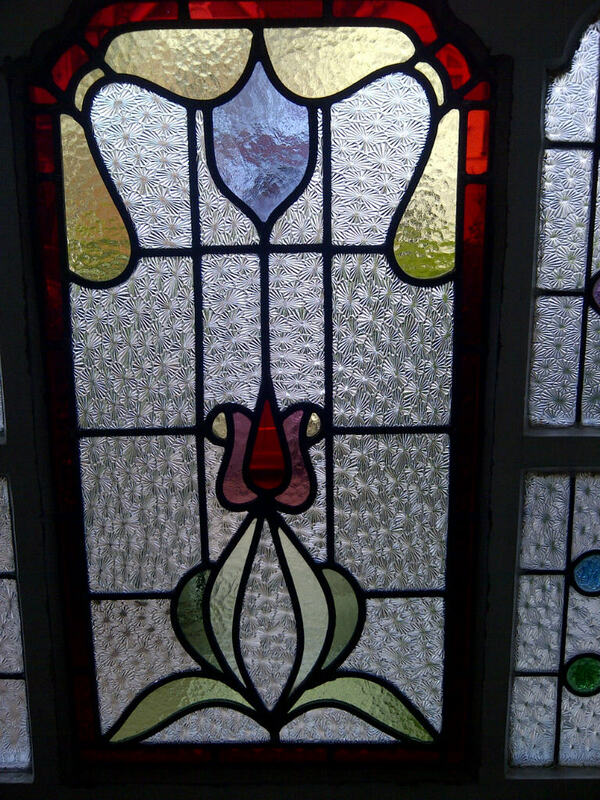 The Edwardian piece features the little roundels in the smaller sections that match the glass colour of the main feature flower. 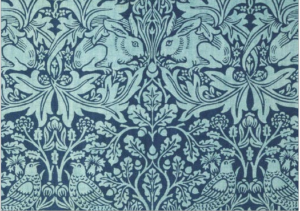 In the Victorian piece, a wider variety of blues and greens have been used and overall much bolder colours. Both pieces have a striking effect and will add interest to your entranceway. 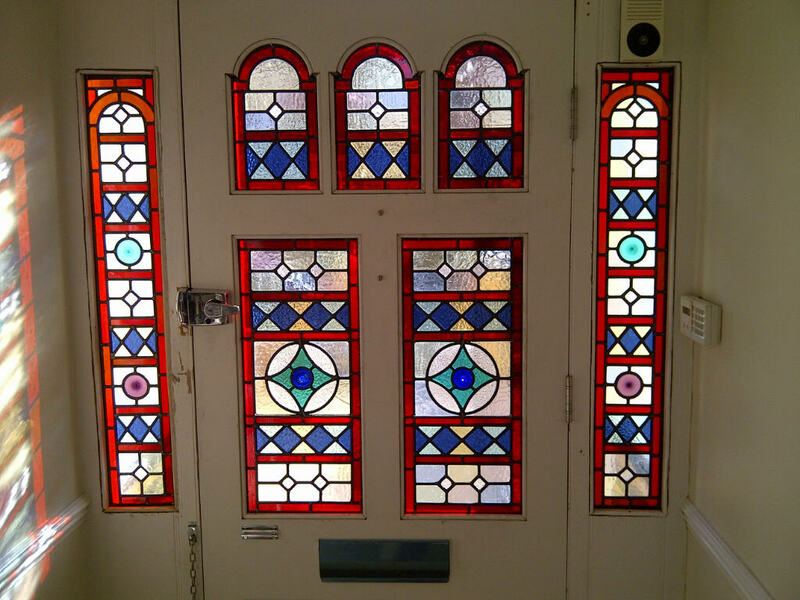 If you’re looking for a stained glass window to compliment the age of your home, or simply just have an idea that you’d like to create, why not take a look at our stained glass portfolio for some more ideas and inspiration to help you with your plans. Check back later this week when we’ll be sharing more of our latest projects with you. You can also follow us on Facebook or Twitter. 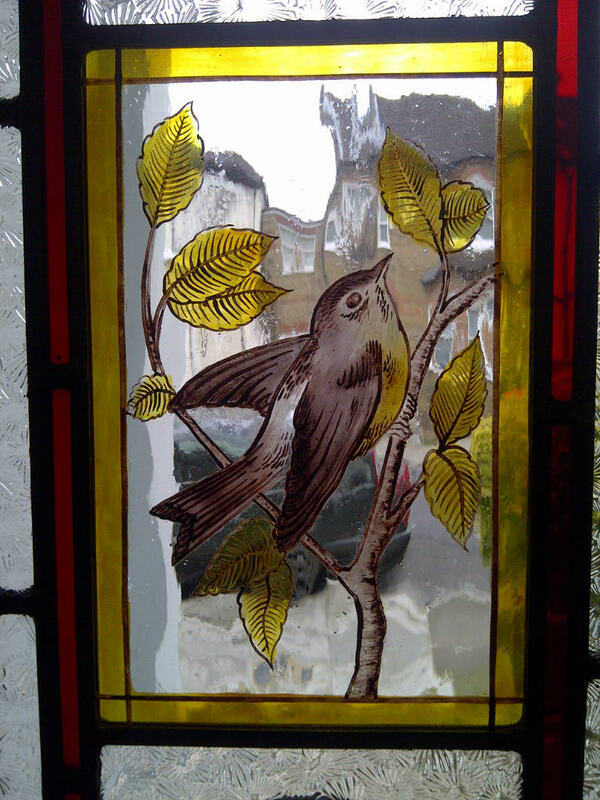 We’ve been extremely busy here at Coriander Stained Glass over the past month and we have many wonderful projects to share with you. 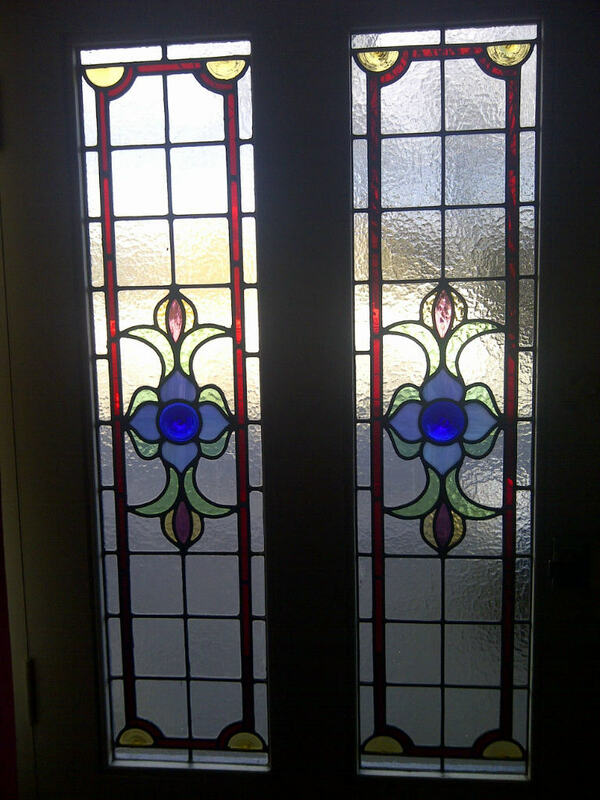 Spring seems to finally have arrived and nothing catches the sun light in your home as beautifully as a stained glass window. 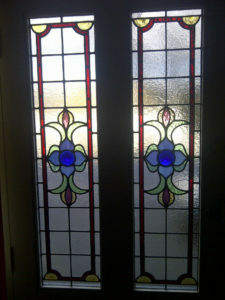 Here are a couple of recent projects we’ve finished that involve hand painted glass. This first piece was for a stairway window in Claygate, Surrey. 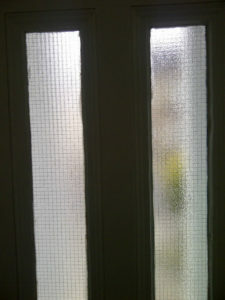 Stairway windows can make a fantastic feature point and really brighten up an otherwise overlooked part of your home. This window has features typical of the Victorian era, with the ruby red border and geometric background in traditional pale shades. 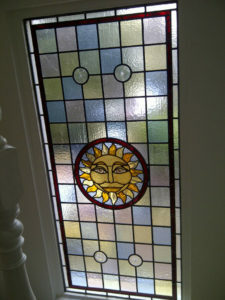 The central roundel feature of the sun has been finished with hand painted glass to add character and charm to the sun. The central feature adds an additional focal point as you walk up the stairway and really finishes off the piece. 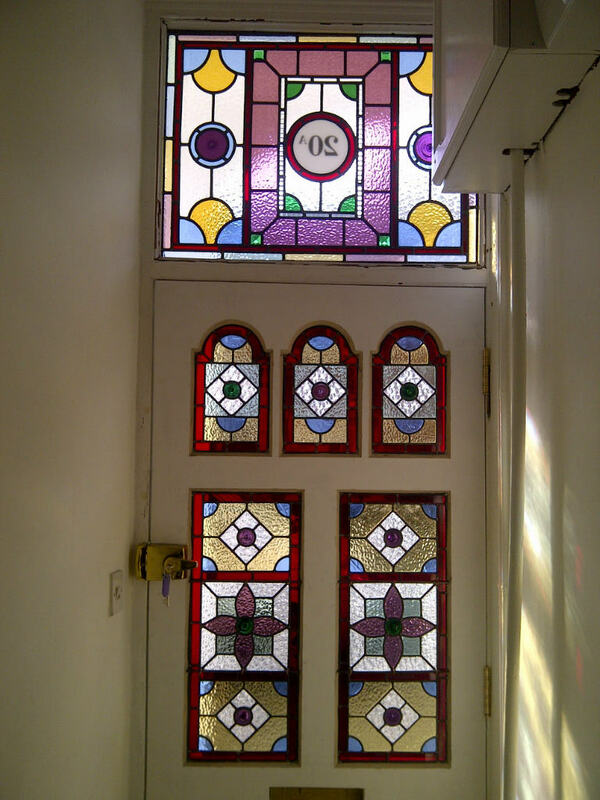 The next piece we’d like to share with you today is a fantastic example of how stained glass can really transform your home. This Victorian piece was fitted in a home in Tooting. 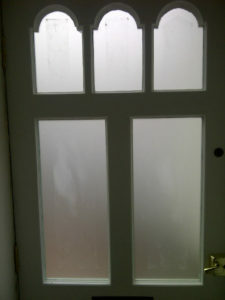 Here you can see the front entrance as it was prior to fitting. 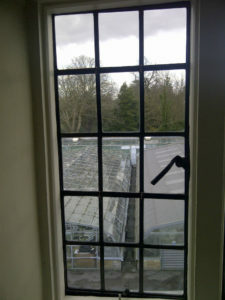 The glass is removed and the frame made ready for the new stained glass. 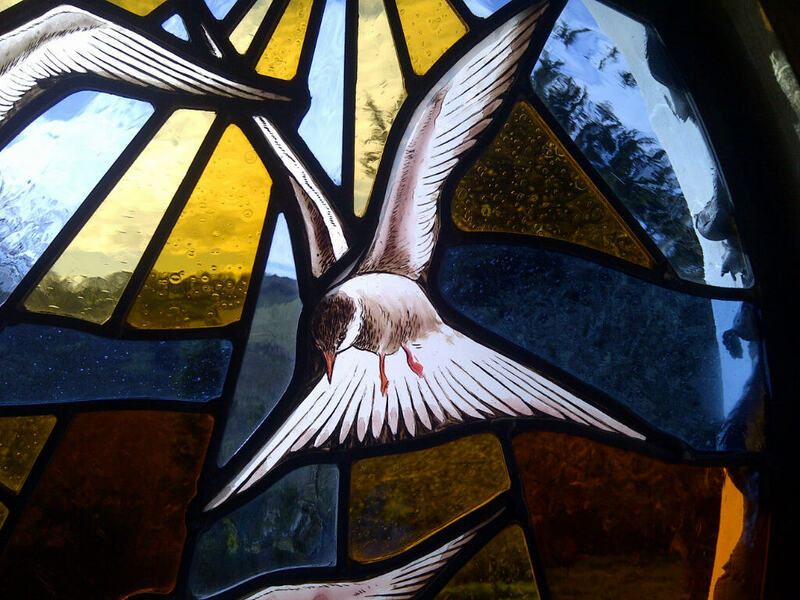 The central features of this window were lovingly hand painted and kilned by our in house artist, Margaret. The finished piece really brightens up the entrance way to this home. The beautiful hand painted birds are a lovely addition to this piece, and the overall effect is quite striking. 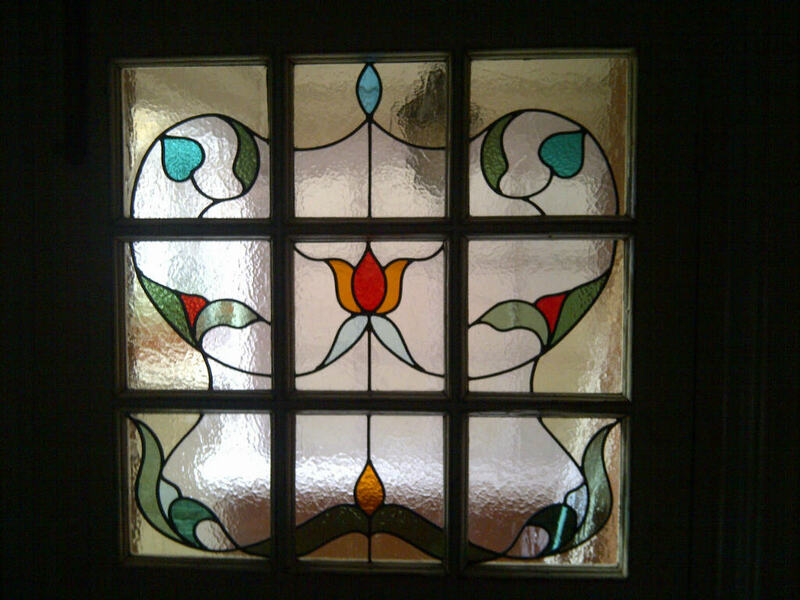 If you’ve an idea for your own home, why not take a look at our stained glass portfolio to give you more ideas for a stained glass window of your own. 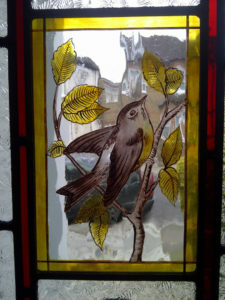 That’s it for today from us here at Coriander Stained Glass, but check back later this week for more of our latest projects. You can also keep up to date with our latest news on Facebook and Twitter. 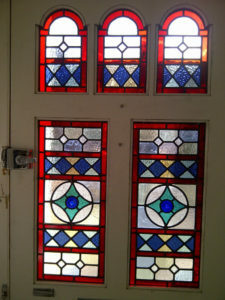 This week at Coriander Stained Glass we have been very busy with a project in Devon. 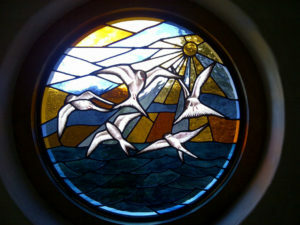 Combining coloured and hand painted glass, this beautiful round window creates a stunning focal point for the home. This picture shows the process of the leaded light coming together; after creating a template for the design each piece of glass is hand cut and laid over the design. The hand painted birds are also laid out at this stage, after they have been kilned. Here you can also see the lead is being cut to size and moulded to the shape of the glass prior to soldering. The pins are used to hold the glass in place whilst the window is being pieced together like this. 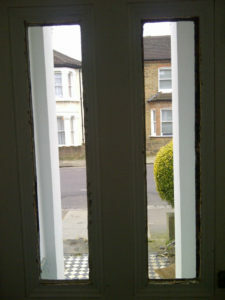 After soldering and cementing, the window is ready for fitting. 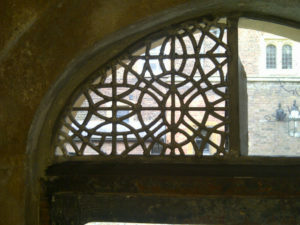 Here you can see the last part of the process, with the window in place and the putty waiting to be cleanly cut away. Already you can see how beautifully the light shines through and has created wonderful patterns on the wall beyond. And finally here we have the finished piece with some close ups of the birds lovingly hand painted by our in house artist, Margaret. 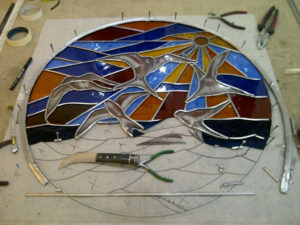 The finished piece looks wonderful and is very in-keeping with the beautiful Devonshire coast. 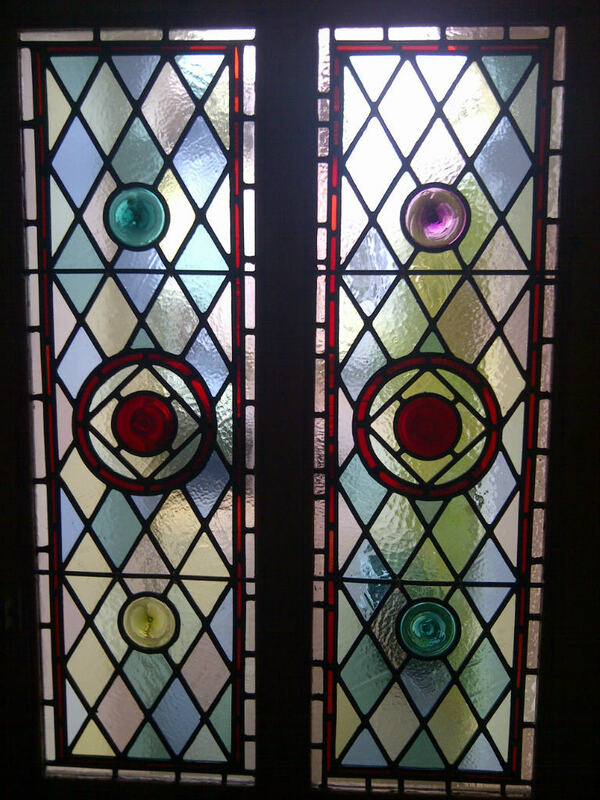 Despite our London location we are happy to cater for all requests across the country so if you have seen something you like in our stained glass portfolio or have an idea of your own please do not hesitate to give us a call or drop us an email. And finally for today we’d just like to say a very big thank you to all of you who have been supporting us on Facebook and Twitter. 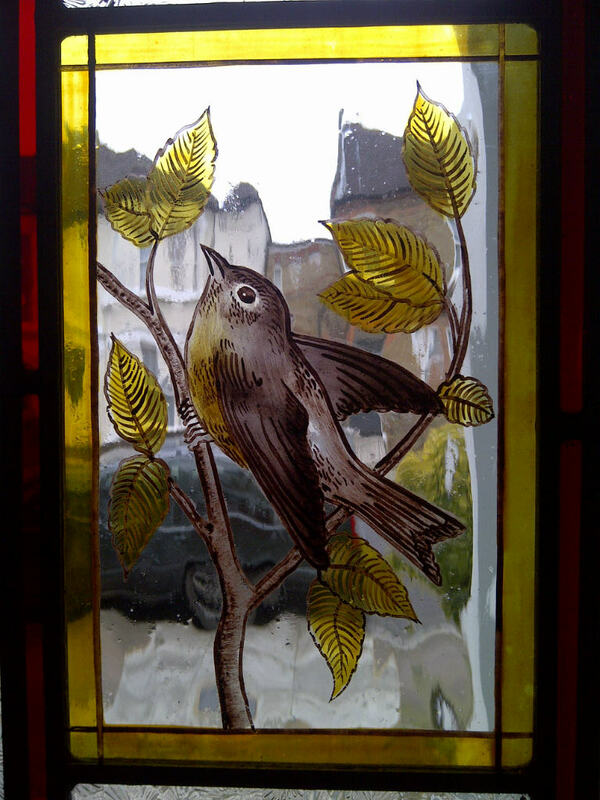 Check back later this week when we will be sharing some more hand painted work for a Victorian Stained Glass window we have recently completed. 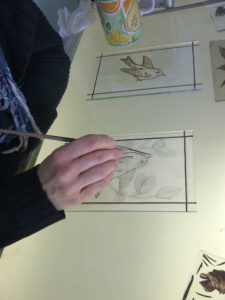 We’ve been busy here at Coriander Stained Glass and we’ve a couple of projects to share with you today. 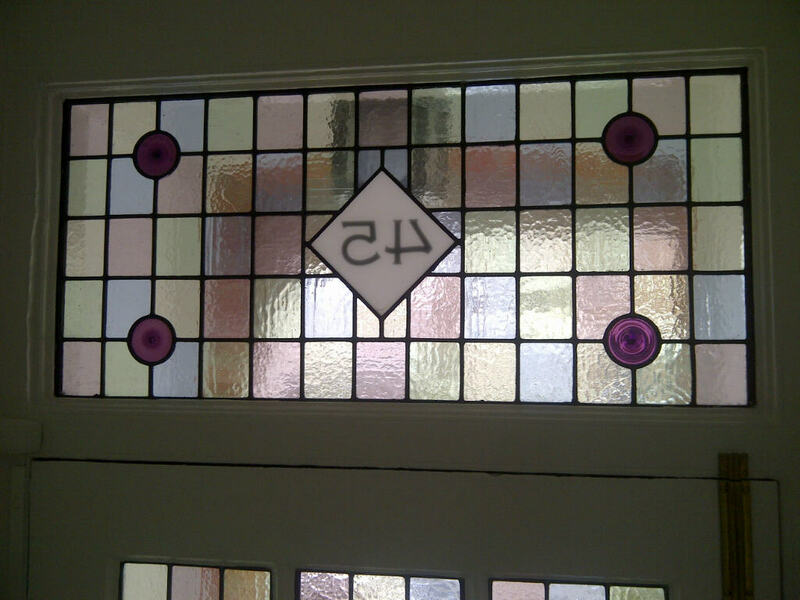 First of all we have this simple design recently restored in a front door in Southfields, South West London. 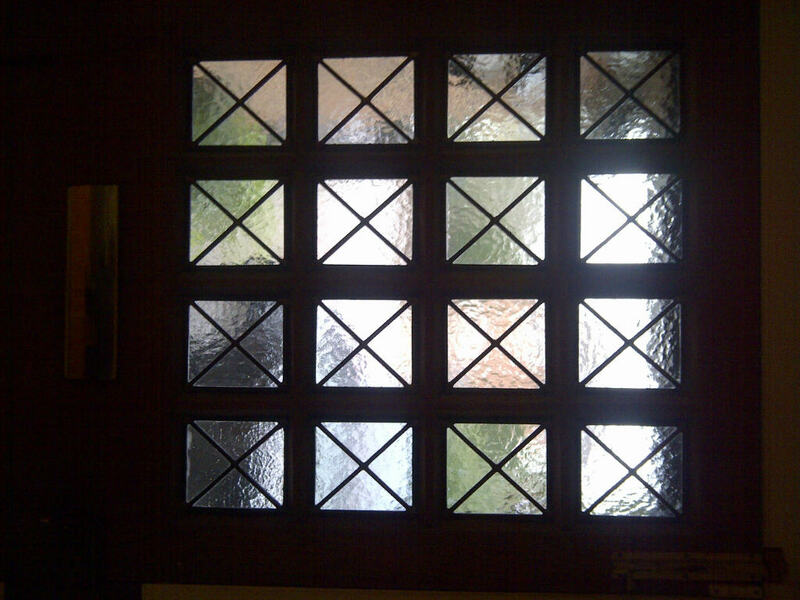 The smaller, feature windows make a simple design quite eye catching, accompanied with the textured glass. 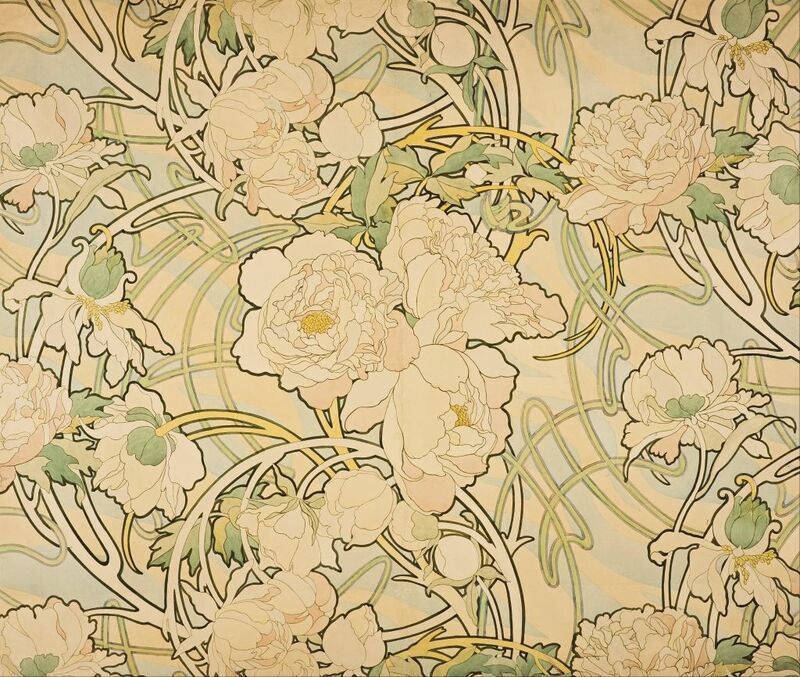 This piece is typically Edwardian with many of the defining features of the era; a flowing floral design over a background of clear obscure glass. 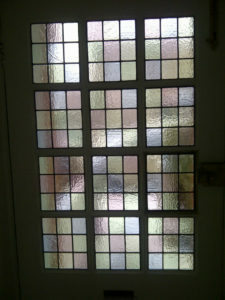 The main features have been picked out in stronger colours and different textures of glass have been used which are both also features of this era. 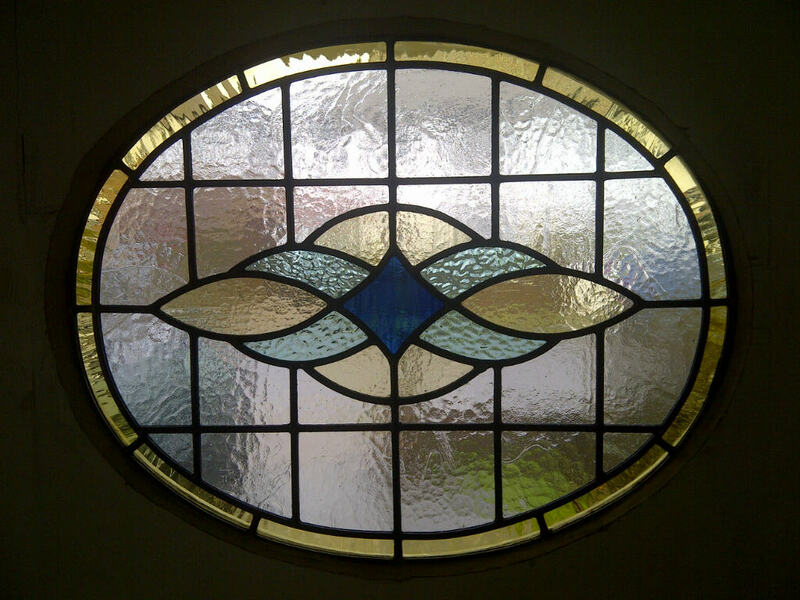 If you’re thinking of a stained glass design for your own home, head over to our stained glass portfolio page for more ideas and inspiration. For all the art lovers out there, our pick for the Easter weekend is the Becoming Picasso exhibition at Somerset House’s Courtauld Gallery, until May 26th. The exhibition documents a 19 year old Picasso’s move from Spain to Paris in 1901, and the work he prepared for his first exhibition in the city. Although this exhibition does not hold any of the famous Picasso works we know and love, if you’re looking to see what inspired greatness, then these paintings were where it really all started. Tickets cost £6 and can be booked via the Courtauld Gallery website. That’s it from us for today, but check back soon for our latest projects. You can also follow us on Facebook and Twitter!